The project consists in the implementation of customer service offices. They are located in a commercial premise in the centre of the city with a complex geometry, full of turns and structural elements that interfere in the understanding of the space. In order to organize the interior space and make its functioning effective, the turns are regularised by linked orthogonal geometries. Every one of the regular spaces are assigned to a different part of the programme. Each regular room is defined and distinguished from the contiguous rooms by the use of different tonalities, which go from white to different shades of gray. The ceilings are thus turned into a sort of signage that defines the various uses. 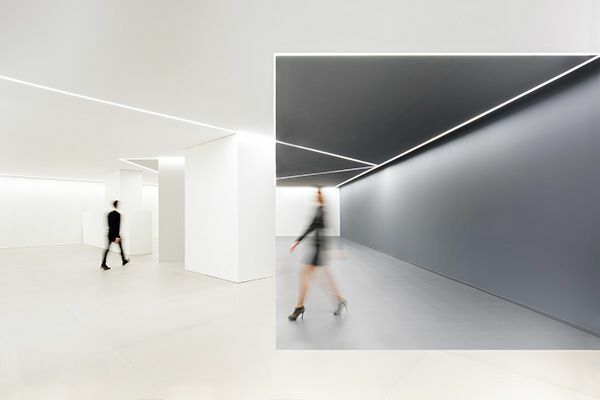 The indirect lighting placed in the ceiling reinforces this idea and allowes the use of light fixtures whose length provides service to every workspace. The activity is concentrated in the first two meters of height. The office is organized and disorganized with the daily work, while the ceiling remains always ordered.